The Yalla Natural Campaign, a new initiative that aims to reconnect people with nature in order to live healthier lives, has been launched by Weill Cornell Medicine-Qatar (WCM-Q). Yalla Natural is part of the ongoing Sahtak Awalan: Your Health First campaign, and aims to help all members of the community to boost their health naturally. This could be by cooking with fresh and healthy ingredients, eating lots of fruit and vegetables, exercising outdoors with friends and family, and growing fresh produce at home for the dinner table. 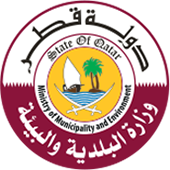 The new initiative was launched with a two-day event on Doha’s Corniche on Thursday 19 and Friday 20 February that unveiled the Yalla Natural Trailer, a 12-meter custom-built transportable activity and information hub. The trailer will pop-up across Qatar to hold free interactive events, dispense advice from expert nutritionists, WCM-Q physicians and gardeners, and offer free exercise classes for the whole family to take part in, like aerobics and running. Children will be able to get hands-on by planting seeds and will be given grow-kits to take home with them to learn about fresh fruits and vegetables. Healthy cooking lessons and tips will be offered from the trailer by French chef Eric Cousin of the Chef’s Garden Restaurant, which is operated by AMLAK Services, a member of Qatar Foundation. In the coming weeks, the trailer will tour a number of easily accessible locations such as Aspire Zone on 5 and 6 March, Qatar Foundation for five days from 8 to 12 March, and Katara on 26 and 27 March. 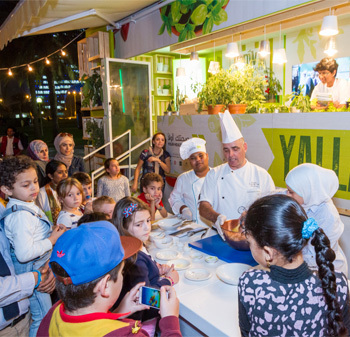 A series of free theme evenings as part of the Yalla Natural Roadshow will see the trailer used to host pop-up public events such as the Yalla Natural Diner that will offer quick-to-prepare food made from healthy and natural ingredients. The trailer events will also feature the distinctive green Your Health First “blender bikes” – bicycle-powered smoothie makers – that have proven a big hit with children at previous Your Health First events and are a great way to encourage young people to exercise. Later, the trailer will travel to other parts of Qatar to make the campaign truly inclusive. Dr. Javaid Sheikh, Dean of WCM-Q, said: “Research has shown that encouraging people to participate in healthy activities and giving them the tools to adopt healthy lifestyles is far more effective than simply telling them what they should or should not eat and that they have to go to the gym. Yalla Natural will offer the public free recipe cards, nutritional information packs and exercise cards, and people will be able to weigh themselves and find out vital health statistics like their BMI using equipment carried by the trailer. Everyone who takes part in Yalla Natural can tweet about their experiences and share their healthy pictures with the community by using the hashtags: #YallaNatural #YHF and #SahtakAwalan. People can also visit Your Health First on Facebook, Twitter or Instagram and share information on the produce they have grown, healthy meals they have created and exercise sessions they have taken part in. Mohammed Al Samhari is a fitness expert who was offering people advice about nutrition and exercise at the Yalla Natural launch. Mohammed, who played football for Qatar Sports Club between 1990 and 1998, said that it was not necessary to always go to the gym and that people could start exercising today in their own homes using the objects around them. For example, stairs could be used for step exercises, an old tire could be used to provide resistance when jogging, or you could use a box to jump on and off. He also advised the public to spend less money on restaurants and eating out, and more time at home cooking fresh, healthy food. Sahtak Awalan: Your Health First is a five-year educational public health program launched by WCM-Q in 2012 in association with the Supreme Council of Health and the campaign’s strategic partners, Qatar Foundation, the Supreme Education Council, Qatar Petroleum, Occidental Petroleum Qatar, ExxonMobil and Qatar Olympic Committee. The campaign is aimed at all ages groups but has a special focus on encouraging young people to make healthy lifestyle choices so that they develop good habits at an early age that will stay with them into adulthood.